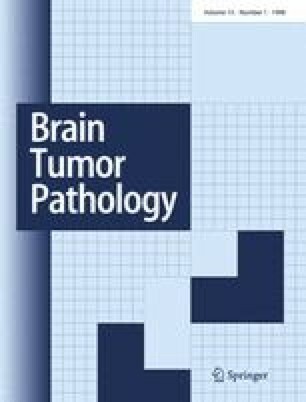 We report a case of papillary tumor of the pineal region (PTPR) and describe the morphological, immunohistochemical, and neuroimaging findings. A 43-year-old man presented with signs of increased intracranial pressure and upward gaze palsy. Magnetic resonance (MR) imaging demonstrated a heterogeneously enhanced mass in the pineal region and obstructive hydrocephalus. Proton MR spectroscopy revealed increased choline and decreased N-acetyl aspartate peaks with a slightly increased lactate peak. Minimum apparent diffusion coefficient value was 0.60 × 10−3 mm2/s. Positron emission tomography showed significantly increased [18F]fluorodeoxyglucose uptake at the site of the lesion. He underwent total resection of the pineal region mass, resulting in resolution of the symptoms. The tumor consisted of columnar and cuboidal cells, with papillary growth pattern. Immunohistochemical staining showed positive reaction for neuron-specific enolase, S-100 protein, and vimentin. Ki-67 labeling index (LI) was 13.1%. These features were consistent with PTPR. Postoperatively, the patient received radiochemotherapy, and maintenance chemotherapy at our outpatient clinic, and was doing well without tumor recurrence 1 year after the surgery. Although the morphological features agree with those in the original description of the PTPR, the Ki-67 LI and radiologic findings suggest the malignant nature and the necessity for adjuvant therapy.